Well, we didn't..... we got a big 1/10", we'll take what we can get though, it sure perked up the corn. The chicks are growing too, I looked in on them this afternoon and one was sitting on the edge of the box, looking around. It's time to get a chicken wire cover on it before they start running around my shop. 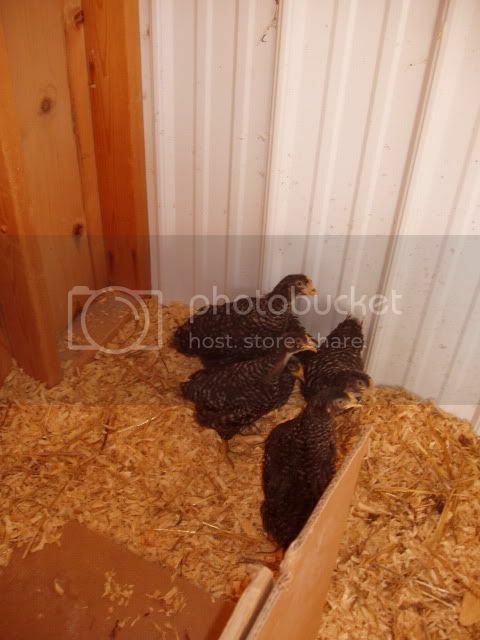 They will move into the chicken coop in a couple of weeks. 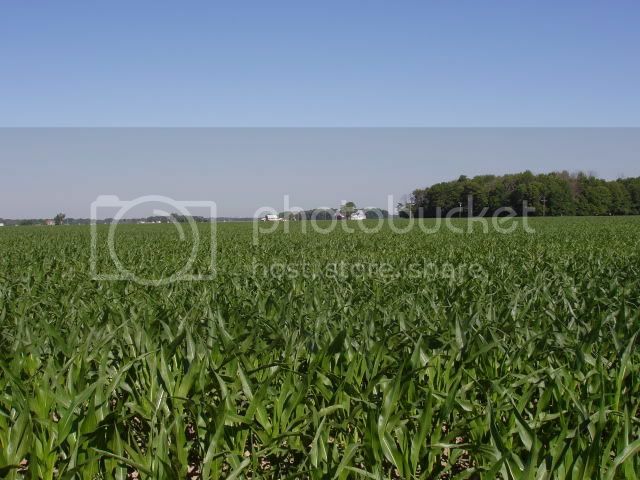 The corn is still green but it's really showing signs of stress. It's already going to be affecting the yield, even at this stage. We need substantial rain pretty bad. I'm just afraid when we get it now, it's going to be a goose drownder. Last but not least, in our pictures of all things growing, the Swallows are filling the nest. Last year, they raised 6 in there, as near as I can tell, there are only 4 this year, but they got an early eonugh start that they may raise another brood. We'll have to see. The new nest hasn't progressed any further, but the pair is still hanging around. I think they may be waiting on nature to give them some mud. Do you suppose the Swallows chose that particular spot to nest because of the warmth given off by the incandescent bulb close to the eggs? If so, clever call on their part. 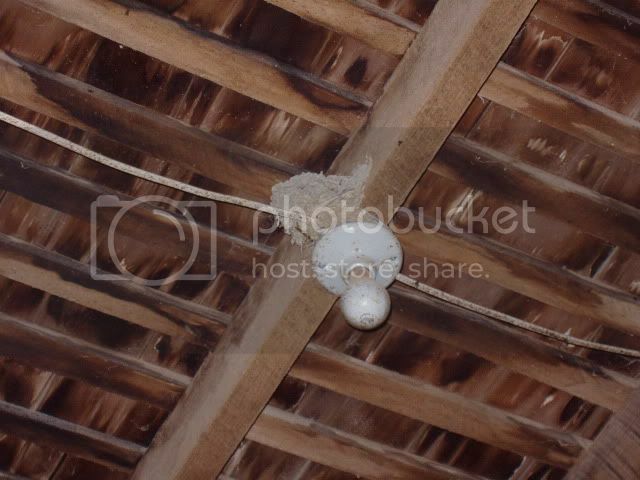 bw77 wrote: Do you suppose the Swallows chose that particular spot to nest because of the warmth given off by the incandescent bulb close to the eggs? If so, clever call on their part. I think they chose that spot because there is a little ledge where the electrical box is wider than the rafter, it gave them a good foundation to start building on. In the summertime, when the Swallows are here, those lights aren't on for very long, so they wouldn't know about the heat given off. 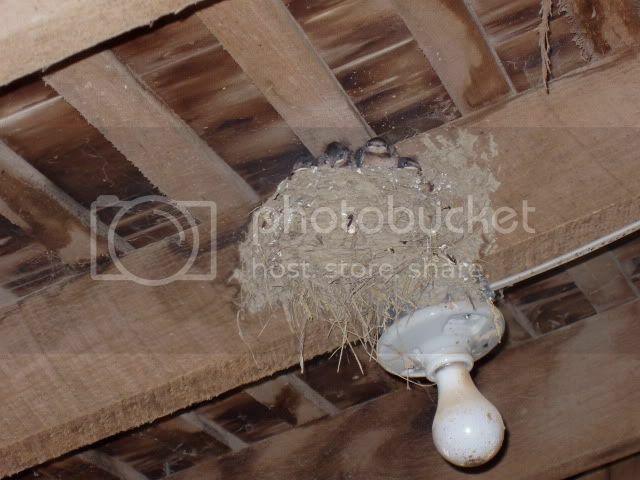 Since we are talking about the Swallows, the nest is almost empty. They've been leaving, about 1 bird every day since Saturday. Sunday afternoon, there were only two birds in there and by evening, all four were back. This is the only one left, he's been alone since yesterday afternoon. The parents and the youngsters that left were all hunting in the barnyard this morning, so they are still around. 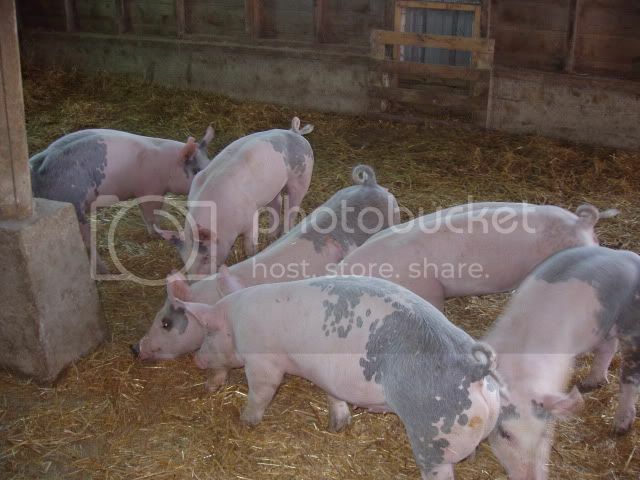 The pigs are growing, they have slowed a little since we've been having hot weather. They do most of their eating at night and in the mornings now, afternoons usually finds them sprawled out on the cool concrete in the breeze. 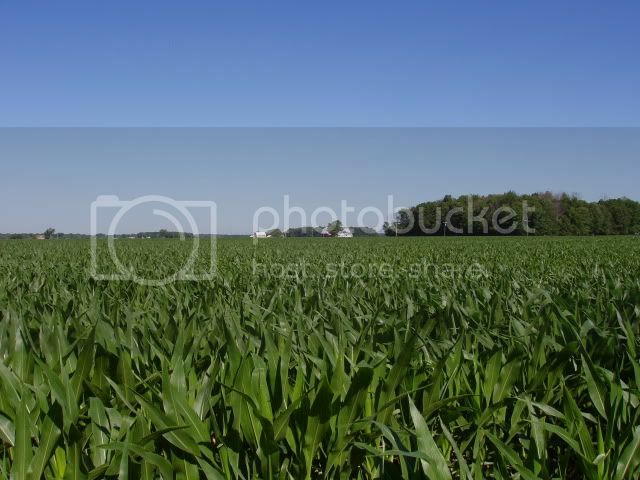 The corn is still green but needs a substanial drink. We got another 1/10" Sunday morning, but more is desprately needed. It's about waist high now. The chicks are coming along also, they got an afternoon running semi-free, in the yard, Saturday for an hour. They spent most of the time wondering where they were, it's a pretty big change when all you know from life is the inside of a big cardboard box. 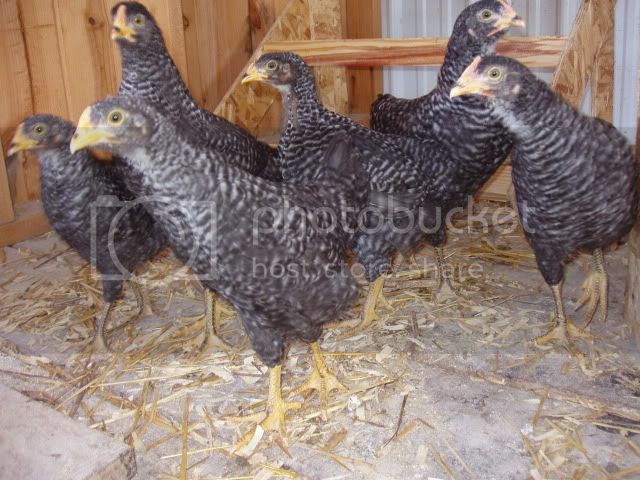 They'll be headed for the coop in a couple of weeks..... I'm ready to get my shop back. I guess that's it. I came inside to sit in the AC for a few minutes and thought I'd update the thread. Nothing much new around here other than a phantom animal we've seen the last few nights. I think it's a fox, but I haven't been able to see more than a shadow moving. I guess I need to start carrying a flashlight when I go out for my last barn check of the night. What's the destiny of the chicks, Tim? Are they layers? or fryers? And I think you told us the variety, but I forgot. They shure ain't Rhode Island Reds!! Pretty bird, Tim. And it looks like a good strong physique, too. Save me a few eggs!! OK, time for a quick picture update. All the critters are doing well, but the crops are in desperate need of a subsatantial drink. We had a small shot of rain the end of last week, but it was less than 1/10". I'm surprised anything is green anymore. Pig's first, they are growing pretty well despite the heat. Seems like they have extra energy in the morning since they lay around all afternoon to stay cool. Lots of running and playing first think in the a.m. I had to take a picture of the partial group since they wouldn't give me a nice pose. The chickens are feathering out nice. They got to spend the afternoon outside yesterday. It was fun to watch them learn to scratch and chase bugs for the furst time. 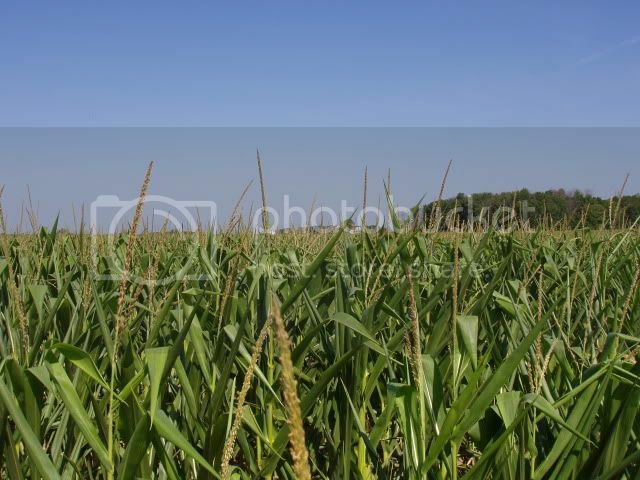 Last picture is the corn. When I started this part of the thread, I thought it would be neat to show everybody how fast the corn actually grows when it gets a good start. Welcome to farming..... when everything lines up to look like a good year, Mother Nature kicks you in the shins. 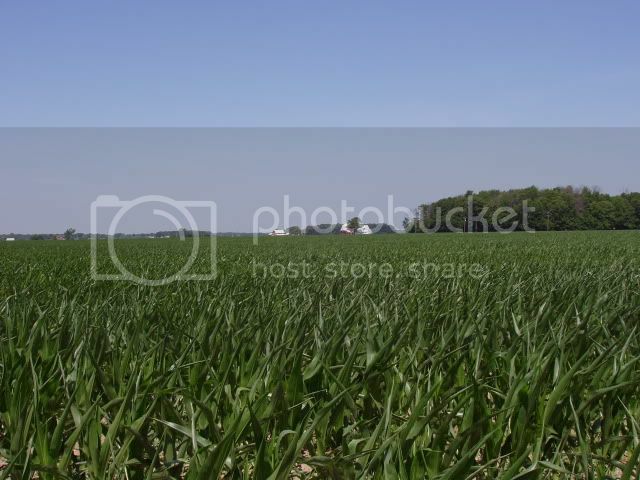 This corn is about chest high, but it should be towering over our heads and probably tasseled out by now. Even if we got the rain we needed from here on, the damage is done, the yields are already reduced, but it'll keep getting worse if we don't get some moisture. Anyhoo, without further delay. The pigs are enjoying a break in the hot weather, everytime we walk in now, they jump up and run around, it's a nice change from just watching them lay still and try to stay cool. They don't like the heat anymore than we do, maybe less since they can't sweat. 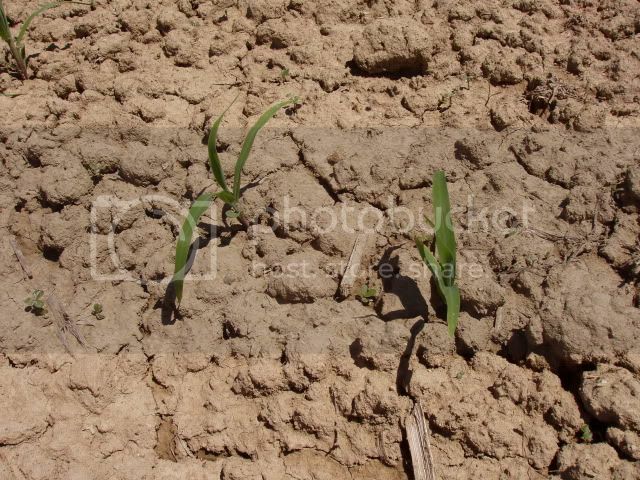 The corn is trying to grow without enough moisture. It just started to shoot tassels. As you can see, it's just about eye level now. We've had a few showers in the last two weeks, but none of them bigger than 1/4'. It all helps though. With the cooler weather, I was able to spend yesterday afternoon in the shop. 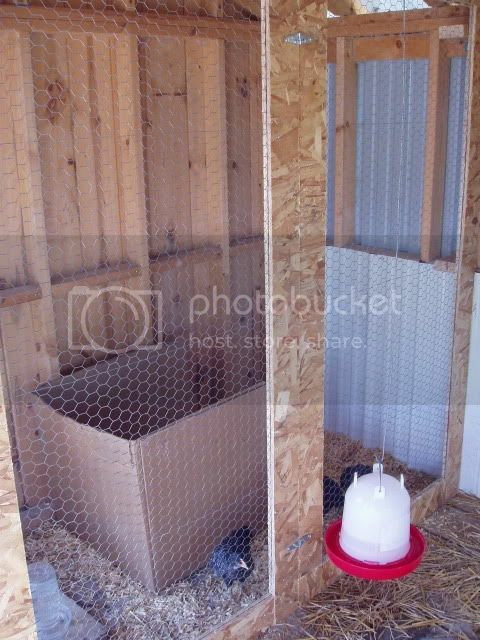 I got the panels done that allowed us to move the new chicks into the coop. 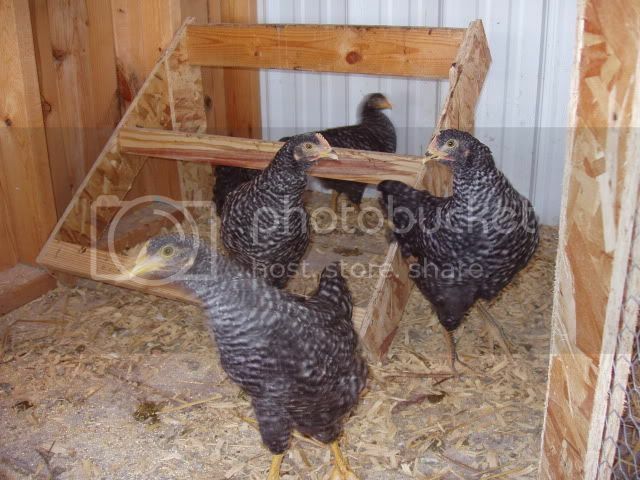 We have to keep the seperate from the old hens for awhile so they don't get roughed up. Hopefully, in a couple of weeks we'll be able to mix them. They are growing nicely and are one of the few things that seemed to thrive in the heat. We cut their cardboard box, that's been home to them, in half and put it in with them so they'd feel safer. I don't think any of them went in it after the first few hours. We'll leave it for one more night, then they'll graduate to just the open space. They are enjoying their new found freedom. I think that's it. Hopefully, we'll have a calm few weeks to make up for our past schedule. Did you get a decent amount of rain yesterday? Up in the city (at least on the North Side), we had a deluge at noon that settled into a day-long pattern of intermittent showers - in other words, a real soaker, sufficient in volume to flood Wrigley Field and delay game time by 4 hours (!). But it was very regionalized, in that I spend a chunk of the afternoon in Wilmette, where it appeared to not have rained at all by 4:30 PM, when I headed home - where it started up again, albeit gently, at 5. My purple millet threw up tassels literally overnight. Sweet! Hope you had a similar meteorological day on the farm - radar for today looks promising, too. Fingers crossed for you. sundevilpeg wrote: Did you get a decent amount of rain yesterday? Up in the city (at least on the North Side), we had a deluge at noon that settled into a day-long pattern of intermittent showers - in other words, a real soaker........... Fingers crossed for you. The rain never reached us..... barely even a cloud. I'm truly happy for anyone getting rain this year, and I thank you, and everyone else, for their concern and prayers. There are enough people whining about how hot & dry it is, and I don't want to be one of them. We'll make it through this, just like other adversity that seems to be a part of farming. My room mate in college used to say; "If it was easy, everybody would do it". I always seem to fall back on that saying, and it never fails to bring a smile to my face. 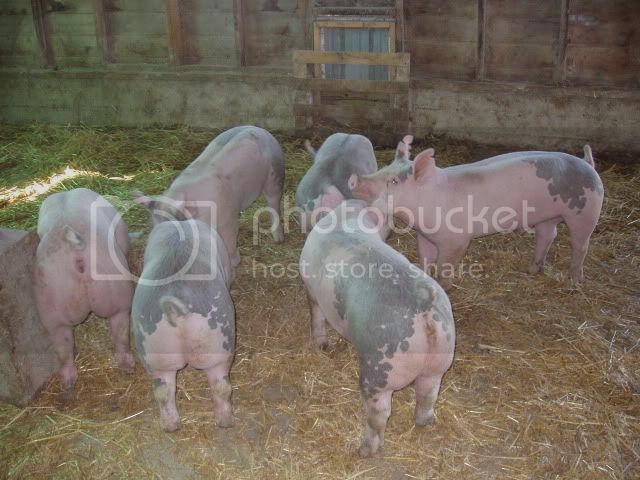 Pigs are growing pretty good in spite of the heat. They stay up late eating and do all their moving around and playing before noon. Then they find a cool place to lay down and pretty much stay put until evening. When it get's over 100°, we will give them a spritz with the hose a few times, throughout the day, to help them stay cool. They are looking pretty good, to be ready to go the first part of September. 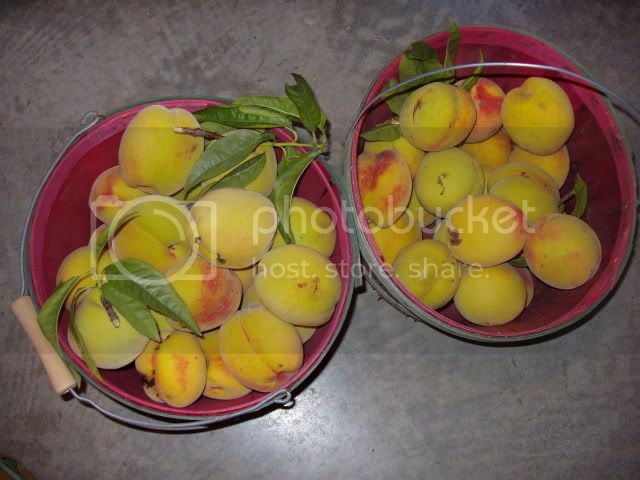 For some reason, Photobucket is fighting me this morning, it doesn't want to upload my pic's. 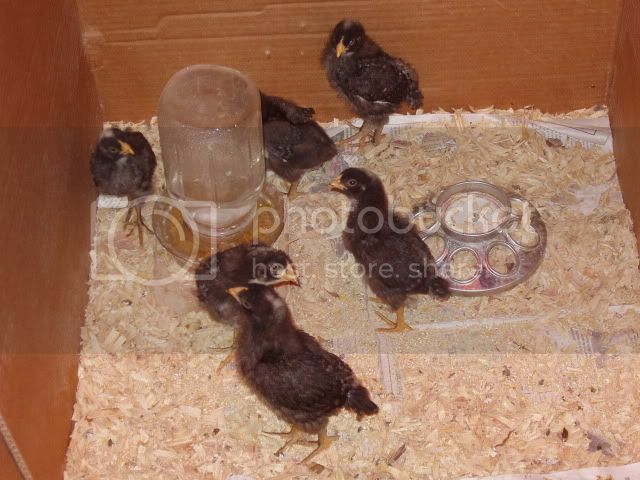 I'll add a picture of the chicks later. 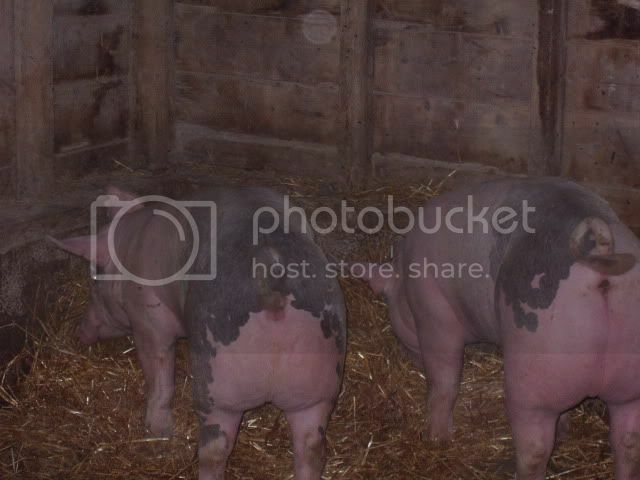 Photobucket is being more cooperative this morning. Here's yesterdays picture of the chicks. Hope they hurry up and grow fast, we lost one of our old hens last night. 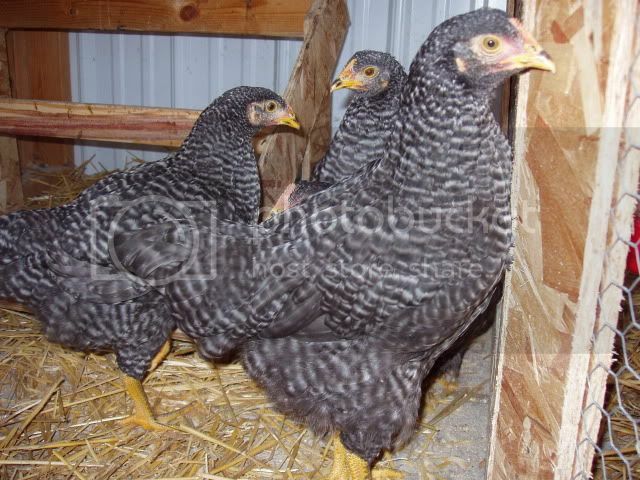 I don't want to have to start buying eggs, waiting for these girls to grow up. Woooo Hoooooo!!!!! We finally got a substantial rain!!! 3/10" fell on us this morning and then we got a full inch tonight about 6 o'clock. 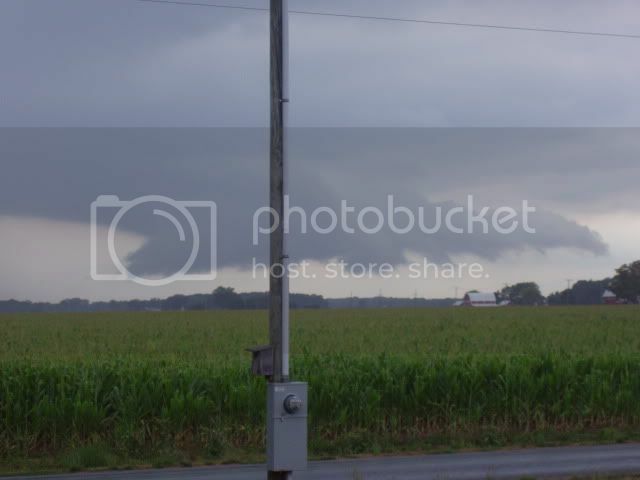 I was gone, but my wife took pictures of the approaching storm. I haven't seen water laying on dirt since early April..... and it didn't lay for long. 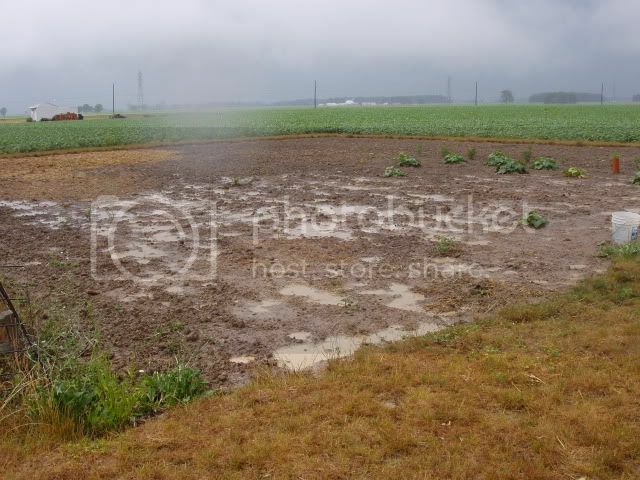 Believe it or not, pretty much that whole garden is planted, we never got enough rain to soak down to the seeds. This will bring the corn, bean and peas. It's too late for the corn that comes up, but the peas and beans might make a Fall crop if we continue to get rain now. It's nice to smell the wetness outside tonight, it's the first time I've heard frogs and insects in a long time. Best regards Tim! Really hope this rainfall does what it needs to do for you. So glad for the update, we got a good soaking here, and I was wondering if it made it to Ohio. OK, time for new pictures. We ended up with 1 1/2" of moisture out of last week's rain. It really perked things up. Yesterday morning we woke to a tenth of an inch of drizzle and again this morning. It's nice to have a cloudy day for a change. I talked to the feed mill owner last week, he had been to Iowa and said it wasn't quite as bad there as around here. That's a little more comforting, know there will be corn coming from someplace. I walked out in the soybeans last evening, last weeeks rain set some pods on them. The yield will be reduced, but we'll have a crop if we continue to get moisture. 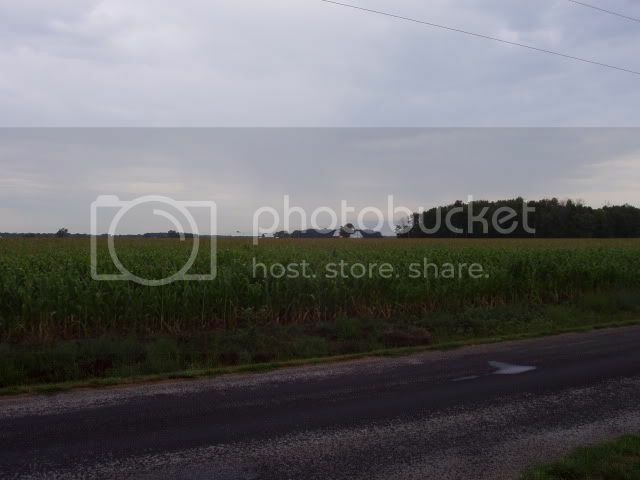 First picture is the corn, since it's finally over my head, I backed up and stood on a tree stump for the view. 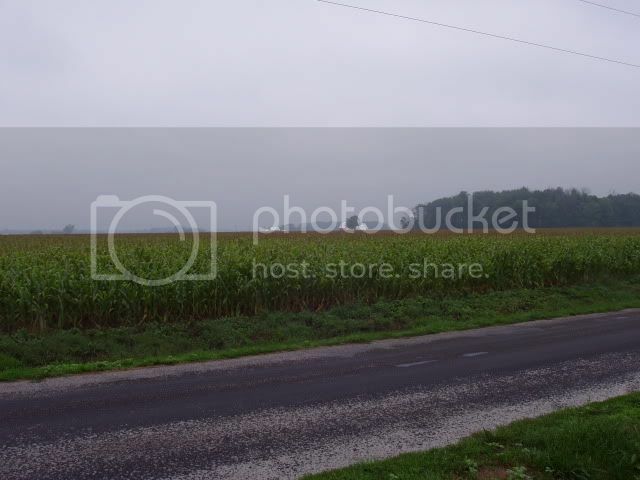 The overcast sky is better to look at than to poor corn. 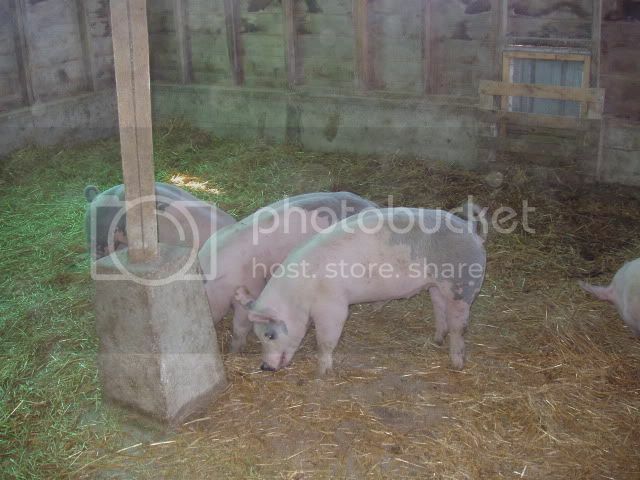 The pigs continue to grow, they have about six weeks left and look like they will be right on schedule. I hope I got my last load of feed last Friday, it's getting pretty expensive. The hens are getting bigger too. They got to run free in the yard last night for about a half hour, while we watched over them. They are still small enough, they'd be pretty tempting to a hawk. They'll be running free in another couple of weeks. 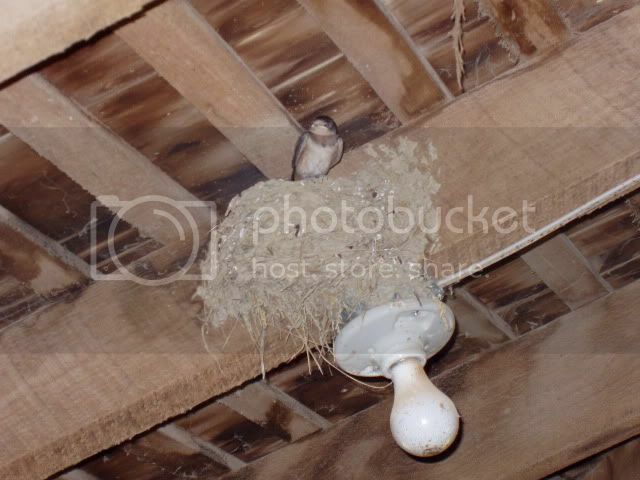 The last picture is a new Swallow nest in the barn. They started it as soon as they came back in the Spring, but it got so dry they gave up on making mud. Last weeks rain let them continue construction. I don't think they'll lay eggs any more this year, but it'll be ready next year. It looks to be about 75%done. I'll climb up and get a better picture when/if they finish it. That's it for this week, thanks for reading. Neat to see how the pigs have gotten so much longer and to see such a big change in the chickens' appearance over the course of this thread. Greetings from NW Ohio!! We are still too dry, but the inch and a half of rain we got 10 days ago, along with quite a few dribbles of 1/10" rains has put a green tint back in our grass. It has also set quite a few pods on the soybeans. We need steady rains to fill the pods, but at least it's a start. 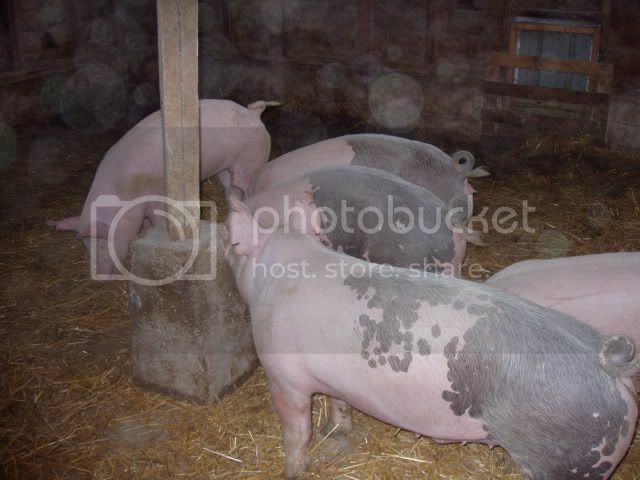 The pigs are still growing, and eating what has become very expensive feed. When we put these in, we were looking at a record corn crop and falling grain prices. I was hoping we could fill peoples freezers with cheaper halves than we've been offering the last few groups..... then along came Mother Nature. I just scheduled processing for the last four this morning. The whole bunch will be going in Labor Day evening, to two different processors, for Tuesday morning slaughter. 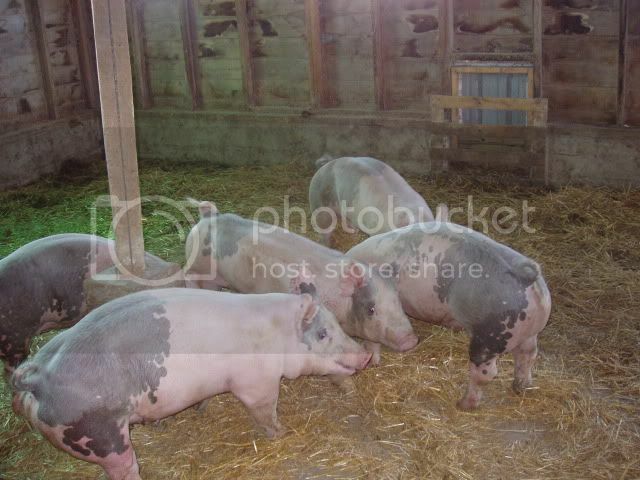 One more month of room and board for the porkers. 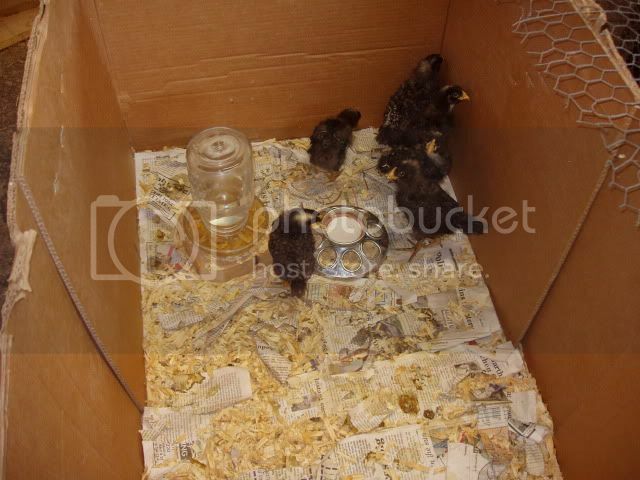 The chicks are still growing although the changes aren't as noticeable as the first month. Instead of the field of corn picture this week, I'll show you the sweet corn in the garden. We planted this the 12th of May and last weeks rain was the first moisture that soaked the seeds. We have a nice stand, but the season is too short now for any yield..... unless we have a very late frost, which I'm sure won't happen this year. Last random shot of the week. 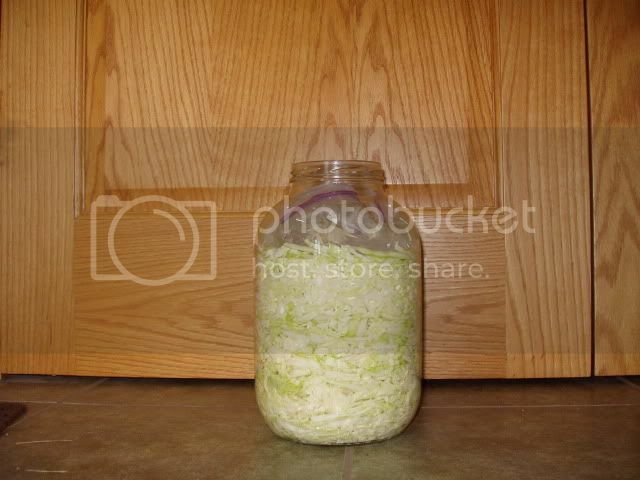 This is our third attempt at saurkraut making. We've had technique and equipment failures the past two years, I think this time will be a success. It's still early enough this year, we should be able to make another batch if this one works out. 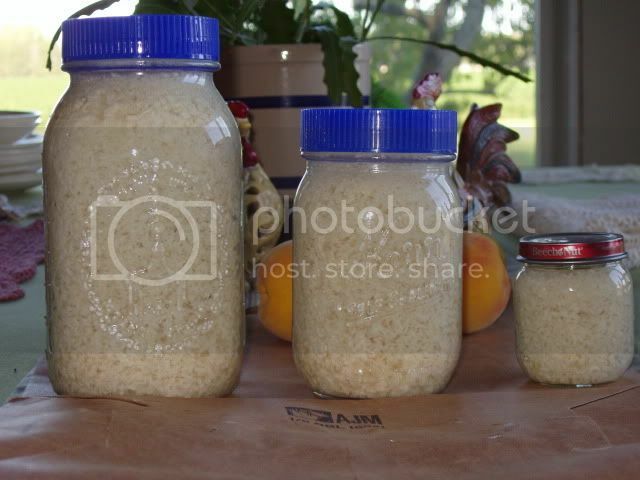 It's already starting to ferment, the garage is smelling this morning and it's only been 48 hours. That's it, as always, thanks for reading along. Just a quick update this week. We got 1.8" of rain last Saturday and Sunday and more is supposed to be here for the next few days. The soybeans are really looking good, it's a miracle anything survived the heat and dry. The pigs are enjoying the cooler temps. They continue to eat and grow. Three and a half weeks from loading day. The chicks are getting bigger too. It won't be long before we have to put a light in the coop, on a timer, to give them the 12 - 13 hrs of "sunlight" they like for peak production. Nothing else caught my eye this morning so there is a shortage of pictures, I'll try to do better next time. So glad to hear you got some rain, Tim! Did you salvage any corn? 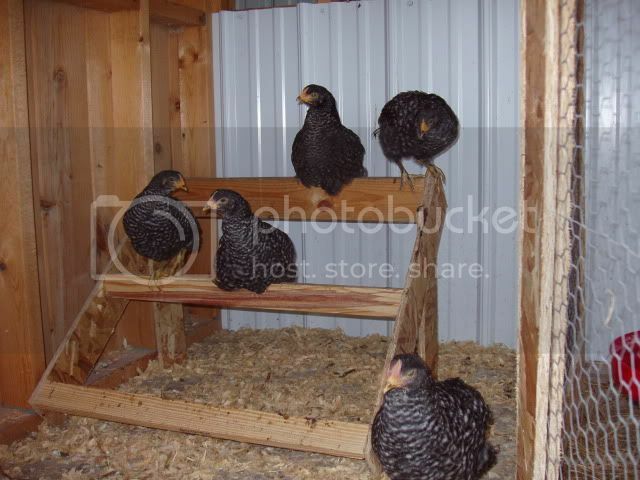 What kind of light do you use for the chickens? Made me wonder if you used one of the sunlight or plant and aquarium spectrum lights to mimic the natural spectrum. I use them for gro-lights and they're both cheap and effective. Say "hi!" to the piggies for us!! The light for the chickens is just a plain old 60 watt bulb. Nothing special, I think they just need to be awake and moving around. Just a little chicken education for anybody that's never been around them, when the sun starts to come up, the chickens jump down from their roost and spend the day scratching for food. Right around dusk, the all head back into the coop and jump up on the roost for the night. We go out and close the door every evening to keep predators out, and open it again first thing the next morning so they can roam the yard. When the days get short, egg production slows because their ancient ancestors didn't want to be raising chicks in the winter and it takes energy to make eggs, and food gets scarce if they're in the wild. Instincts are a wonderful thing, they haven't been able to breed that out of them, so you just have to fool them with artificial light. We've had a pretty steady rain this evening since about 9:30. I just went out, and there's an inch in the gauge, supposed to be more coming overnight. The corn is pretty much past hope. This moisture will help fill the kernals that are on the ears, but there aren't very many kernals to start with. As early as the corn was planted this year, it should have yielded 175 - 200+ bushels per acre in this area. 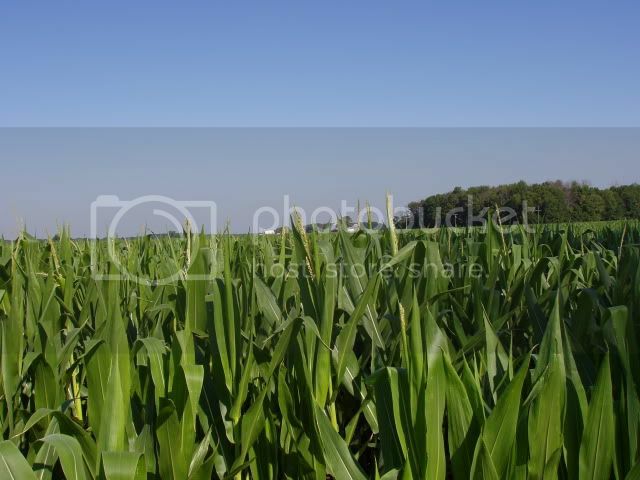 I think it'll be a good crop if it goes 60 bushels this year. 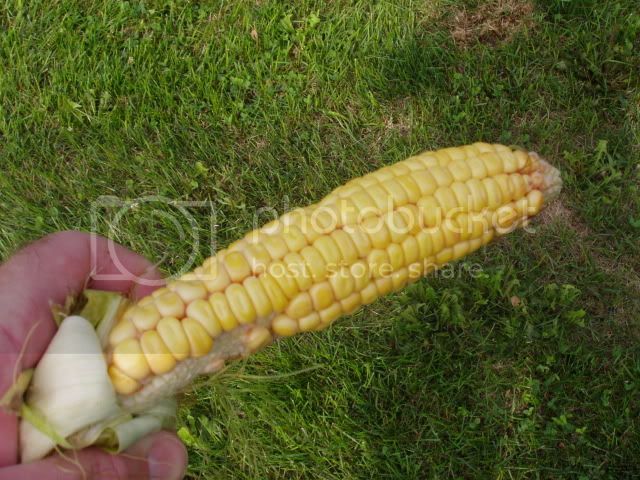 Alot of the corn was so stunted, it shot tassles without an ear to pollinate, that's not something that can be fixed. The window for pollination is only about a week and conditions have to be right for a good crop, even if the ears were there, it was too hot and dry for a proper job. I just hope the rest of the corn belt is better than around here. Soybeans are a little more forgiving, they'll blossum and keep blossuming for a few weeks, every time we got a dribble of rain, they set more pods. The rains now will make the beans in those pods bigger. In a good year, soybeans will have 50 - 80 pods per plant with 3 to 5 beans per pod. This year, it's looking like about half that in the good fields, and most are going to have two or three beans per pod. A good crop of beans around here will go up to 65 - 70 bushels per acre, I'm guessing it'll be half that if we are lucky. So there you go, you ask a couple little questions, and you learn more than you ever wanted to about chickens, corn, beans and droughts. I do want to thank Geo, and everybody else, for your concern, thoughts and prayers this year. It really does help. I love this thread--every tiny detail of it. Thank you Tim for finding us and providing these glimpses into the world of pigs and chickens and corn and soybeans and, unfortunately, drought. Wishing you the best of luck for a good price for your piggies and lots of eggs from your chicks! Time for an update full of pictures. We got another 3/10" of rain overnight. It was sure nice to fall asleep, hearing a gentle shower on the roof last night. Anyhoo, on with the update. 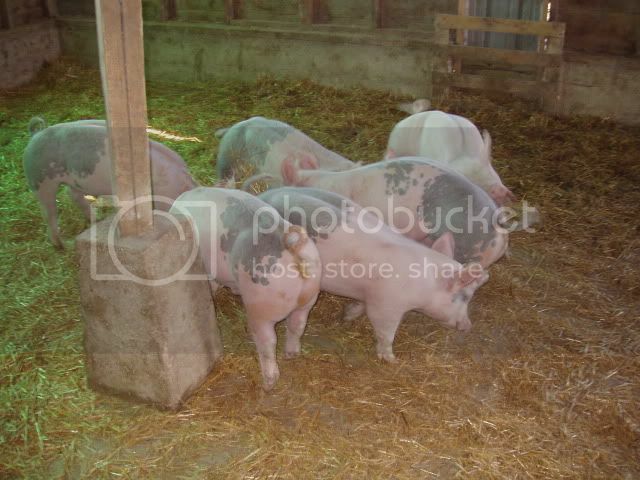 Pigs have 3 weeks to go, the cooler weather has them standing at the feeder more. They are probably 250# right now and we should be right on track for 275# when they go in. The corn hasn't changed much, I'll try to get a picture of an ear next time. I didn't feel like getting wet walking into the field this morning. This is a better picture of a rainy morning than a corn field. 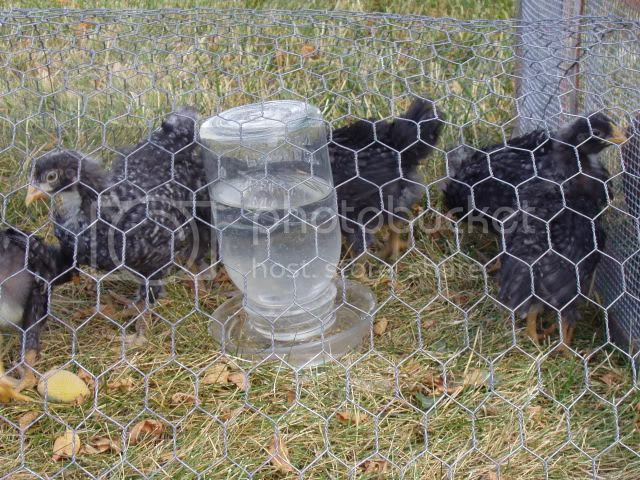 The new chicks got to run free, without supervision, for the first time yesterday. They put themselves away when it started to get dark, so they are on their way. They are still eating grower feed instead of laying feed, so we are keeping them closed up in their little corner of the coop for half the day so they don't fill up on the wrong kind of food. Just like kids, we want them to eat the right thing while their bodies are forming so they have a long healthy life. I'm pretty excited to have my own patch. 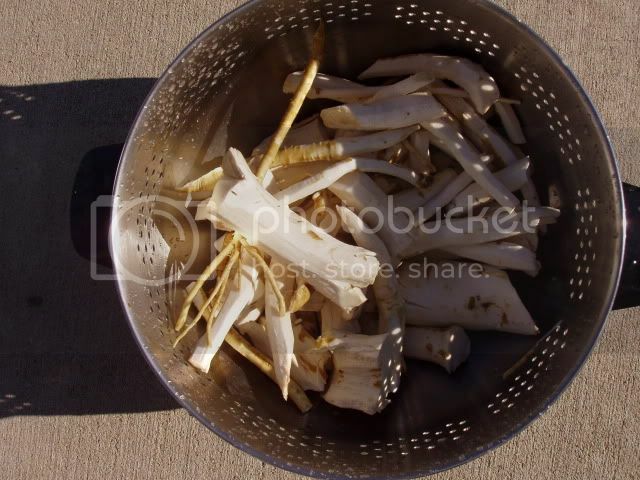 Horseradish grinding was an old tradition for my dad and me. The patch at home was in the end of the garden, dad would just plow through it every Spring and I'd hurry out to pick up the roots before he made his next pass. After he got done plowing the garden, we'd clean up the roots and run them through the old meat grinder in the shade of the tree in the side yard. (If you tried to do it inside, the fumes would literally overtake you). We'd then take the big bowl of the ground root inside, and mom would cover it with vinegar and we'd put it in jars the next day. Dad's been gone for almost 6 years now. My brothers and sisters and my wife and I have harvested the patch at home a few times since that, but it just seems like we never have time when we are all there at the same time. It'll be nice to have our own patch, that we can harvest when the time is right and we have the time to process it. I can't wait. That's it for this week, rainy mornings make for long posts. Hope I didn't bore everyone with the ramblings today. Glad to see your update, Tim. I'm intrigued about trying to grow horseradish now. Great report. I'm out in California visiting some pals. She raises Ameraucanas (I can hear the rooster even as we speak!) so she loved the pix of your 'girls'. Re: horseradish. GO BACK, IT'S A TRAP!!! I dumbly put a root in my raised bed in Kansas City, it flourished, but I spent the next three seasons trying to eradicate it. I suggest that you raise it in a trash can or some other separate, individual container. But it sure was nice having some fresh root when I needed it. Keep up the great work and reporting, Tim!! 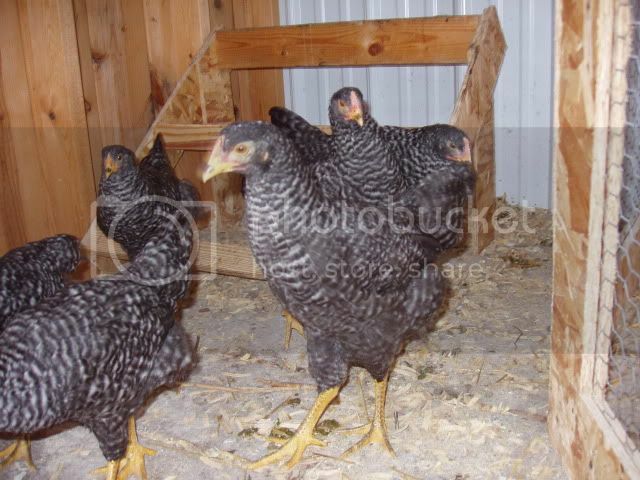 Three of our old hens are/were Araucana's. They are supposed to lay a green egg too. 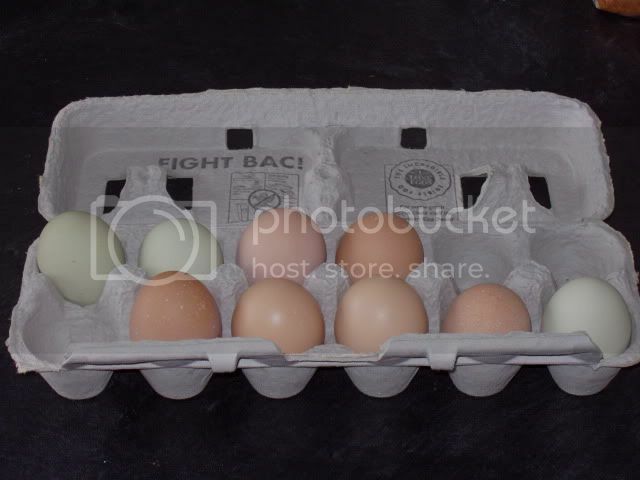 We ended up with one of the three that actually layed a green egg, the other two just layed regular old brown ones. We only have one of the three left, she's a good layer, but she has a temperment that leaves alot to be desired. If she didn't give us an egg pretty much every day, she'd prolly be soup by now. By the way, we didn't eat the other two. A hawk got one and the other one just died one night. They were both pretty good layers too. I walked out in the corn this morning and checked a few ears. I'm really surprised, I hadn't peeled any back for a few weeks. The ears are nicer than I thought, not as big and full as they should be, but alot better than I expected. There may be a little hope yet. As far as the horseradish being evasive, it was never a problem. We had three patches about the size of the one in the picture. I don't remember them ever spreading. I guess we always dug it and turned the loose dirt back into the hole. If you spread the root pieces out, every one of them will sprout so if you were trying to hoe them out of a bed, it might be tough to get rid of. Being as how this one is in the yard, it can get bigger if it wants. 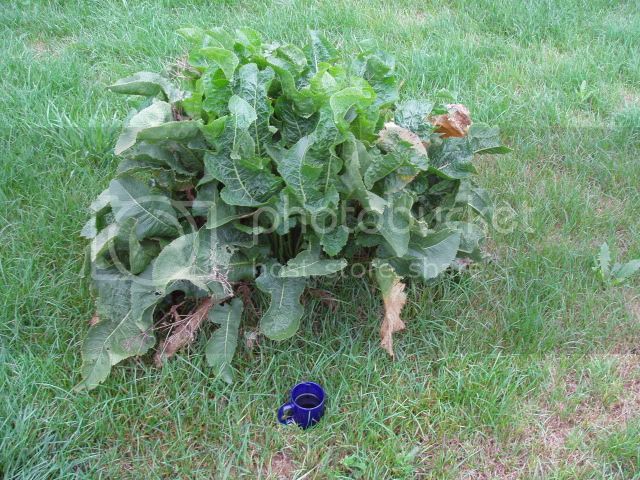 If it gets out of control, I'm not opposed to chemical warfare when it comes to weeds/unwanted plants. I think the mower will keep it at bay though. That's it for a mini update. OK, late night update. There won't be very many more, two weeks from tonight, we'll be loading up the pigs. They are actually ready to go right now, as far as weight goes, but they are scheduled for the 3rd of Sept. This is County Fair time, in our neck of the woods, so the slaughter houses/butcher shops are busier than usual. I had to schedule further ahead than usual and I hedged my bets. I'd rather be too big than too small on the carcasses. Here are a couple in the corner. If you go back to the beginning of this thread, you'll see the same point of view. They have grown quite a bit. I'll pair these pictures up when they are officially finished out. We dug the Horseradish last Saturday. The month is supposed to have an "R" in it, but this year is so screwed up, I didn't think the plant would know the diference. One quart, one pint and a baby food jar. The smell will clear your sinuses but it's not really as hot as other years. The flavor is good though, I'm happy with our first harvest from our own patch. I replanted the tops, so hopefully, our patch will get a little bigger. My goal is to have enough to dig some in the Spring, and some in the Fall. That way, it'll always be fresh and have a good flavor. I guess that's it, we've been enjoying rain and mowing the grass for a change.... nice to see green again. As usual, Thanks for following my ramblings..... just a few more chapters and this book will be read. Late night, quick update. Sorry, only one picture. We've been busy and it probably won't let up until the first snow flies now. 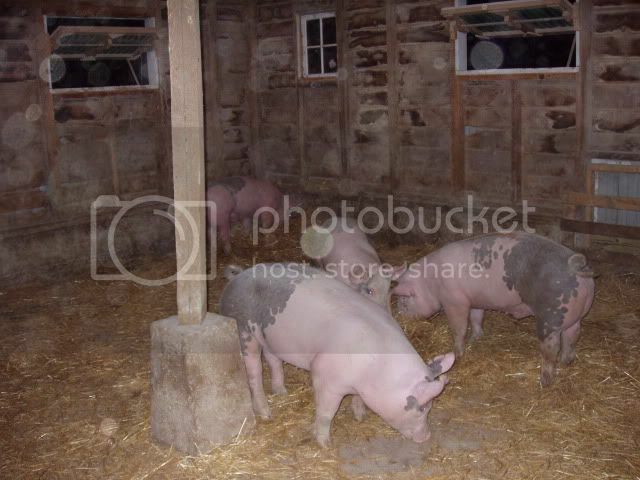 The pigs are doing good and have less than a week to go. If we were selling them to market, they would've been gone a week ago. I have to keep them until the scheduled date at the processor though. They are going to be pretty heavy by next Monday. I'll take pictures the day we load them and maybe some action shots of the loading process.... depends on how much help we have. This thread is almost wrapped up, I started this the 12th of May, it doesn't seem like it should be time to be done yet. Another growing season is about finished. 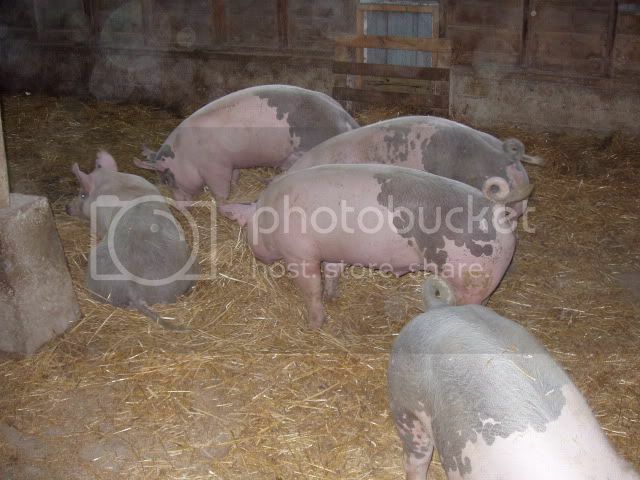 As usual, Thanks for following along, you've all made this bunch of pigs a little funner to raise. I've enjoyed your progress. Now that they season has ended, what do you do? LikestoEatout wrote: Now that they season has ended, what do you do? 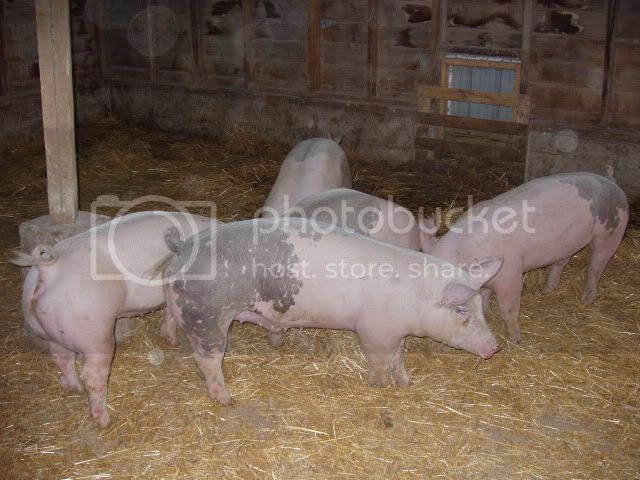 Normally, we would clean out the feeders & waterers, disinfect them and clean the barn the best we could. 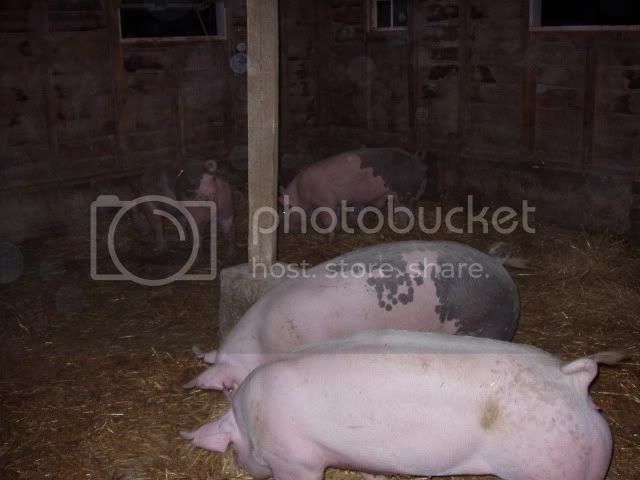 We'd leave everything set empty for 3 or 4 weeks, then get another bunch of pigs. This year, with the drought, we don't know what to do. The price of corn & soybean meal is just so unstable and nobody has any idea where it will top out. We have quite a few customers wanting halves. We are afraid to charge what we'd have to, too make up for the higher expenses. We think maybe if we skip a batch, things will stabilize and we can keep the halves lower priced. Maybe I should ask all of you....... Would you be willing to risk paying a dollar more a pound, to get fresh pork in your freezer by the middile of January?? If we don't put them in right away, we'll wait til late winter, so they'll be ready the first part of June next year. You might still have to pay a dollar more depending on the harvest, but I'm hoping not. 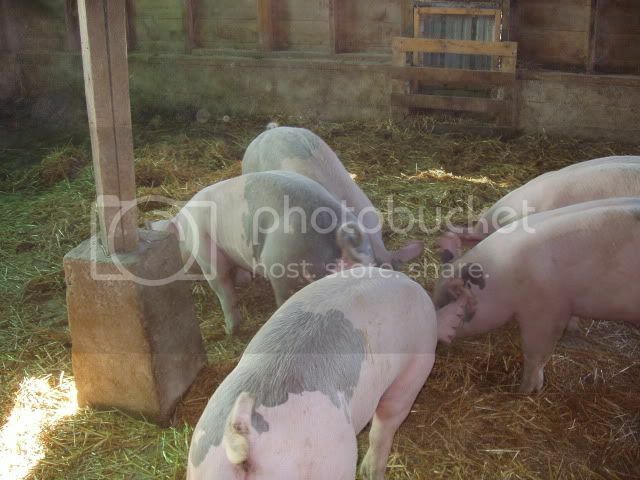 Our goal is quality pork at a good price, we don't want to loose that reputation. One way or the other, we will have to make the decision soon. I've been following along since you started this thread and appreciate your constant updates. Cool thread.